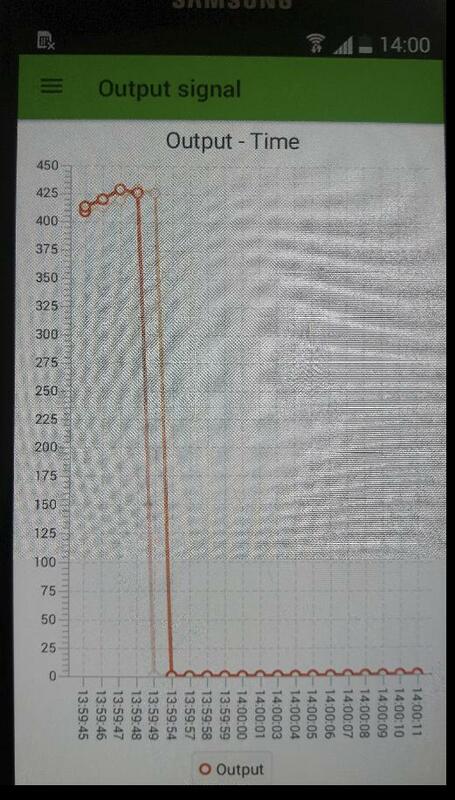 JavaFX line chart freeze after it got an error - Bug? SceneBuilder Kit crippled by Gluon charm hidden dependency? How to configure USB Debugging for Android for a Gluon-mobile app in Eclipse? Question to gluon devoloper: Why Javafxports not support arabic or other languages for Android? I'm using JavaFX with Gluon Mobile. Very good framework for creating mobile applications. 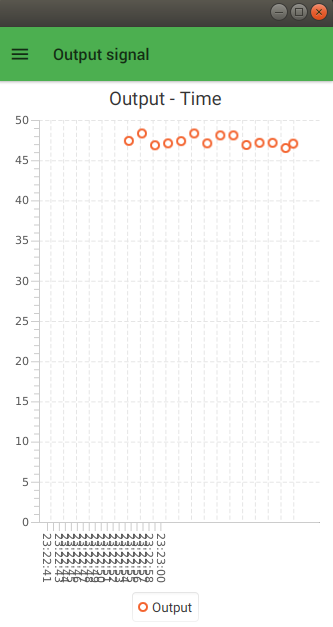 But I have a JavaFX line chart that freeze after it got an error. 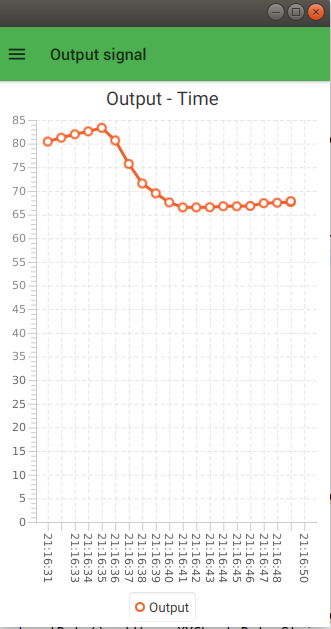 Exception in thread "JavaFX Application Thread"
The line chart looks like this. But after a while, I can see dots after dots disapear slowly and then it's nothing there. It's like the Java FX line chart stopped to update. I have posted some comments where it breaks and what's really happens. 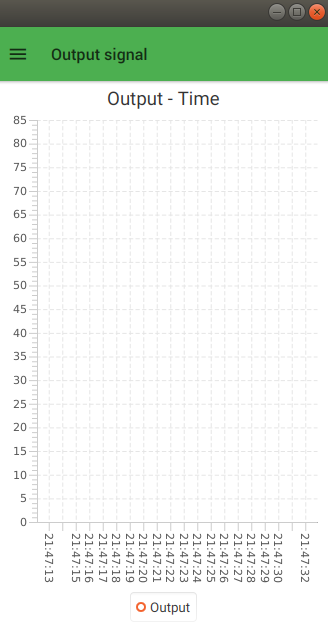 I'm using the line chart for real time logging. Here is the Java code. Here is how it looks when I got the error. The dots deletes more and more. You see that the line have disapear? * What start signal should we use. and while that is perfectly fine for your background task, i.e. your modbus connection and communications, you should never do UI related tasks on it. that triggers a layout pass to render the related node, but that should be done only in the UI thread (the JavaFX Application thread). Run the specified Runnable on the JavaFX Application Thread at some unspecified time in the future. This method, which may be called from any thread, will post the Runnable to an event queue and then return immediately to the caller. So this looks exactly what we need in this case. NOTE: applications should avoid flooding JavaFX with too many pending Runnables. Otherwise, the application may become unresponsive. Applications are encouraged to batch up multiple operations into fewer runLater calls. Additionally, long-running operations should be done on a background thread where possible, freeing up the JavaFX Application Thread for GUI operations. //Loop through the available result sets. //Show data from the result set. And my FXML Label only return the last row: sdfafd, 2019-04-18 and i would like to return all the elements. Downloaded Gluon Scene Builder Kit. Upon execution the program will crash during "EditController" creation - instancing. Tried older versions and scoured the net to no avail. The range of options are (to me) limited as there are hidden dependencies is closed libs. Caused by: java.lang.ClassNotFoundException: com.gluonhq.charm.glisten.control.AppBar at java.base/jdk.internal.loader.BuiltinClassLoader.loadClass(BuiltinClassLoader.java:583) at java.base/jdk.internal.loader.ClassLoaders$AppClassLoader.loadClass(ClassLoaders.java:178) at java.base/java.lang.ClassLoader.loadClass(ClassLoader.java:521) ... 13 more"
Specifically, for a 50k batch: * output = self.model(batch.data) takes 0.03 seconds on GPU, and 0.08 on CPU. * loss.backward() takes 0.11 seconds, and 0.39 on CPU. I see the device using adb devices and the port in the monitor. USB debugging is enabled on the android device. So what am I doing wrong or what is missing ? 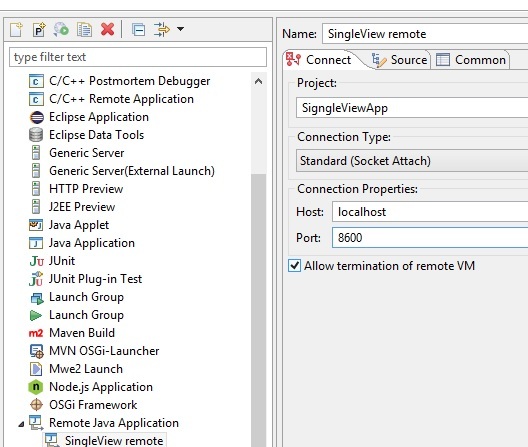 Why Javafxports not support arabic or other languages? Why should we manipulate to write Arabic sentences? Can gluon developers support arabic language and other languages in future?????? I was wondering if the gluon mobile was able to run on UWP mobile device such as windows phone/tablets or is gluon mobile just restricted to Android and IOS ? I have a JavaFX desktop application. It accesses a remote MySQL database via Hibernate and LAN/WiFi. I now try to port it with an as small as possible effort to Android 8.1 using Gluon mobile/javafxports. On the (Windows-)PC the application runs well without this exception. From other posts here on stackoverflow I understand that there is doubt that Hibernate can/should be used on Android. But since these posts are 5 years old or older, I like to ask whether this is still the case and if someone can help regarding abbove exception on Android ? I have a problem with javafx combo box. Fisrtly, I have two combo boxes and one is filled with a list that directly comes from Database.Then, another one that I want to fill a list based on the selected item in the first combo box. My code is as follows but this code is wrong.